Whoever has had the opportunity to dive into a coral reef, has witnessed the indescribable beauty of forms and colors, and the great diversity of creatures that inhabit the marine environments. People often return from these experiences so amazed that they decide to take into their places a little bit of this extraordinary world. It is advisable to set up a marine aquarium only when you are successful in maintaining a freshwater aquarium. However, you can begin by a saltwater aquarium where as long as you try to understand its requirements and preferably if you can count on the help of an experienced aquarist. The assembly of a marine aquarium is an attempt to recreate the sea environment in our homes, trying to get as closer as possible to the characteristics of the water conditions of a coral reef. The coral reefs are abundantly bathed by currents and tides. Thus the water is very clean and free of debris, and water parameters are fairly constant. These areas are more or less shallow allowing the sunlight to spell also abundantly over the coral enabling its growth. The corals are not plants, but need the sun to grow. This is because they house within their tissues an algae (which is called Zooxanthellae) that will process the photosynthesis, resulting extra energy that the coral needs to build its skeleton, made of calcium. For many years different formulas for mixtures were used, that were not very efficient, making the maintenance of marine aquariums a hard work. But now the meaning of each constituent of seawater is known and understood. Now we can find in shops a "sea salt" to mix with tap water and with which we can get a good synthetic sea water, very close to ideal for the sea creatures of reef. The sea water is alkaline. Its pH is between 8.0 and 8.4. The waste from the animals produce carbon dioxide. This gas dissolves in the water and gives rise to a weak acid which causes the pH to become acid (pH less than 7 is acid). However, several factors allow that, in the natural environment, the alkaline pH is maintained. Algae consumes much of the carbon dioxide, preventing the acidification of the water. Furthermore, the skeletons of dead coral, which accumulate in reefs, are composed of calcium carbonate, that is dissolved in water, forming an alkaline solution. A reef is therefore a very stable environment. For all these factors, maintaining a marine aquarium with fish, requires frequent monitoring to detect any trend in the parameters that deviate from the normal, and to avoid unpleasant consequences. In practice, after the tank is stabilized, this requires only a few minutes of work per week. The aquarium should be preferably made of glass. Should not contain metal parts, as in contact with salt water metal react to cause corrosion or rust, the deterioration of materials. Furthermore the oxidation of metals can also lead to change in some parameters of water quality, with disastrous effects for the creatures that will inhabit our aquarium. 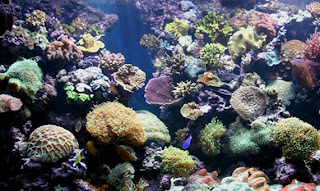 It is recommended that the marine aquarium has a capacity of at least 100 liters. It does not mean that you can not maintain a balanced marine aquarium with smaller dimensions, but you should bear in mind that the smaller the aquarium is the harder will be to maintain the appropriate parameters, and the greater the risk of failure. Never use sand from the beach (that kind based on silica and quartz). Should be made of small pieces of shells (some aquarists use crushed shells), or, preferably, sand from the reef, which is a white material made of crushed coral skeleton, which you can buy in specialized aquarium shops. This type of substrate is essential in the marine aquarium, it is composed almost entirely of calcium carbonate. It is the substrate that will stop any increase in acidity that would occur in the aquarium due to fish food and faeces. Remember that the acid dissolves the calcium. The substrate dissolves rather than the corals that live in the aquarium. Think of the substrate as a protection, a reserve of calcium. Never let a metal be in contact with the water of the aquarium. The sea water is highly corrosive. The metals are immediately attacked. And in addition, the dissolved metals are poisonous to almost all marine beings. Do not facilitate, not even with stainless steel. An abundant lighting is essential in a marine aquarium, especially if you have corals. Must be a clear light, the closer to the sun the better. Thus it provides the light that corals need and you can appreciate better its color and the colors of the fish. We can achieve this kind of light with fluorescent tubes or by special HDI lamps. In practical terms we need around 1V per liter. The danger of having excess of light is small because it is not easy to achieve more than the light present in natural environments. The aquarium can be placed in an area where it receives natural light, but never where it receives direct sunlight. The temperature of tropical seas varies between 22ºC and 30ºC. You should therefore maintain the aquarium water at a temperature intermediate between the 24 and 26ºC by a heater with a thermostat that adjusts to the desired temperature. It is important to keep a strong movement of water inside the marine aquarium. This recreates the sea currents of natural environments and a produces a high oxygen level which is essential for any marine aquarium. The oxygen helps to maintain the quality of water by decomposing organic matter through oxidation. A plate with slots and holes that is placed under the gravel, linked to a stream of rising bubbles, which will produce a movement of water through the gravel. In these conditions bacteria will developed in the gravel that will decompose the waste that falls there purifying the water in a natural (or organic) way. The plate of the filter should be covered with 5-8cm of gravel. Normally the flow of ascending bubbles is achieved by airstones. The best airstones are made of wood as they produce very fine bubbles which also helps the oxygenation of the water. In addition to the biological filter you should have a filter of activated carbon. It is a receptacle with a "screen" of polyester, filled with activated carbon. This system is associated with a water pump that will force the water to pass through this filter. The waste solids are trapped and the carbon removes any organic waste that are not eliminated by biological filter. Over time the bacteria end up colonizing this filter as well with benefits to the system. The pump that works with this filter must pump all of the water of aquarium at least three times per hour. Place the biological filter and the "gravel"
Turn on the heater (24-26°C) and the air pump (attached to the biological filter). Let it run for 24 hours to get the chlorides in the tap water disposed by the action of the air bubbles. The tank is now installed and running, but it should not have the coral inside, nor fish. Give time to allow bacteria to develop in the gravel. Ideally, you should let the aquarium running for a week without adding fish or coral. After a week you can introduce, with no rush (over a few weeks), corals and fish, starting with the smallest. Thus the population of nitrifying bacteria developed as the nitrite is produced by the fish in a sustainable manner. So that, when the aquarium is fully inhabited, we have there the quantity of bacteria with capacity to handle all the nitrite produced by the fish. We can help this process of maturation in the aquarium with the introduction of a liquid that contains the desired bacteria (which is sold in pet shops), or placing a portion of gravel (or a bit of live rock) from an aquarium already matured, so it will colonize the new aquarium. Stones which are porous that can be bought colonized with plants and animals (sometimes corals) and, if it is of good quality and maturity, also carries, within it, a whole set of those bacteria that are beneficial to the biological equilibrium of marine aquarium. After the aquarium is well stabilized, it will accumulate a type of waste that the bacteria can not decompose easily. Which are the proteins. So, it is advisable to have a protein skimmer. It is a device that produces foam. This foam carries those proteins. Thus, producing foam and removing it from the aquarium, we will remove the unwanted proteins and we will increase water quality. This equipment is normally suspended in the aquarium. By means of an airstone (in this case must be of wood) or by means of a special jet (venturi-jet) a stream of tiny air bubbles is produced, that will rise to create foam inside the equipment, which will be accumulated in a small separated tank, to be rejected. This is a device that has an anti-septic function. Produces ozone, and dissolves it in water, killing bacteria and other organisms that are present in the aquarium water. It must be used with caution because it can also end up killing the colonies of beneficial bacteria present in the gravel. It is a very expensive equipment but can produce very positive results as it can also contribute to the decomposition of nitrite. This equipment also has an anti-septic function. All microorganisms present in the flow of water that crosses this piece of equipment are killed through the action of ultraviolet rays. In order to maintain the parameters of water quality at acceptable values, you should maintain a routine of partial water changes. After the tank is stabilized, you should change 10% of the water of the aquarium at least once a month. Remove 10% of the aquarium water and replace it with the same amount of new salt water with the same density of the water of the aquarium. The water in marine aquariums evaporates slowly making the level of water in the aquarium to go down. To adjust this level you should add fresh water (as pure as possible) until you reach the level that the tank had before the water had evaporated. CAUTION: Never add salt water because that would increase the density of water and salinity, putting at risk the living beings that inhabit the aquarium. To maintain a constant density, one should check the water level when it is placed the first time in the aquarium. The replacement of water should always be made up to that level. At least once a month, you should measure the density of water to check if it is not different from the desired density. You should use an hydrometer. There is great advantage of doing this replacement by a slow, dripping, in which we add calcium hydroxide (or Kalkwasser) to the fresh water. This method has to be very well controlled to avoid any abrupt changes in pH and imbalance in the aquarium. It is a great way to provide calcium for corals and invertebrates and ensure that the pH remains high. The calcium hydroxide is a white powder that can be bought in pharmacies in its pure form. Or in aquarium shops wher it is also known as kalkwasser. The system works as follows. Fill up a container with water, it can be a plastic bottle. To this water add the calcium hydroxide in a ratio of two spoons of tea for every 5 liters. Shake it well. Then a small tap is used to drip, during the night, into the tank, replacing the daily evaporated water. Glass tube closed, with a thermometer inside and a scale at the top where we made the readings of the density. Dive the hydrometer in the water and after getting it to float upright we read the water level on the scale, the value of the density of water (or salinity) which must be between 1.020 and 1.025. You must seek to maintain a specific value, per instance 1.022. Sudden changes in salinity, from 1.022 to 1.023 per instance, can cause stress on the aquarium inhabitants. There are tests for sale to various parameters. But the most important are the tests of the pH and nitrite. You should keep them at home and use them whenever there is suspicion that something is not running well, through the observation of fish, corals and their development. The ideal pH for a marine aquarium is between 8.2 and 8.4. 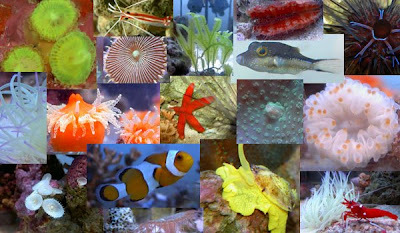 Variations in pH of water can cause several problems for the inhabitants of the aquarium. It is preferable pH values above those limits than those below them. The nitrites should be as close as possible to zero and should never exceed 0.2.